1982 C3 CORVETTE COLLECTOR EDITION PLASTIC INSTRUMENT CLUSTER GAUGE BEZEL - WITH CLOCK. CENTER GAUGE, RADIO, & CLOCK SURROUND BEZEL WITH CLOCK IN DASH. 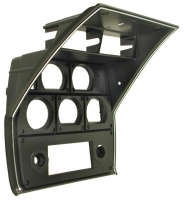 Log In To See Pricing 1981-1982 CORVETTE INSTRUMENT CLUSTER CENTER GAUGE BEZEL - FOR CLOCK IN OPTIONAL DIGITAL RADIO. OIL AND TEMPERATURE NOW IN DASH.